'Restitution for wrongs', or 'restitutionary damages', is the judicial award which compels the wrongdoer to give up to the victim the benefit obtained through the perpetration of the wrong, independently of any loss suffered by the victim. The establishment of a civil trial in Roman law, which left compensation as the main response, and a widespread, loss-centred interpretation of the Aristotelian theory of corrective justice explain, but do not justify the difficulties encountered by modern attempts to account for restitutionary damages. Mistakes in the classification of this institution have complicated the picture. To overcome some of these problems, this study considers the basic structure of restitutionary damages from different angles. In part one, the topic is analysed from a comparative perspective. 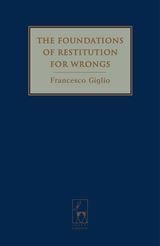 Although the focus remains on English law, the German, the Italian and the Roman jurisdictions provide research data which, in part two, support the development of a theory of restitution for wrongs as corrective justice. Francesco Giglio is a Senior Lecturer in Law at the University of Manchester.